A “crick in the neck” is a common complaint among clients seeking manual therapy. This informal umbrella term can refer to symptoms that range from general cervical stiffness to complete immobility and unrelenting pain. When assessing cricks, therapists trained in Myoskeletal Alignment Techniques (MAT) engage the client’s nervous system through active and passive movements, observing for range-of-motion limitations and local or referred pain patterns. Some clients might report general neck stiffness, whereas others may experience radiating pain that limits the ability to rotate the head in one or more directions. A thorough history intake usually reveals helpful clues to possible neck crick etiology, but not always. The therapist’s left thumb and fingers palpate each cervical vertebra while the right hand flexes, extends, rotates, and sidebends the client’s head and neck, examining for motion restrictions. During the intake process, you may learn that many chronic pain clients carry a diagnosis of osteoarthritis and degenerative disc disease — and are convinced these abnormalities are responsible for their pain. Although these medical terms do sound scary, they are, in fact, part of the normal aging progression of the human spine and, depending on how the brain perceives the threat, may or may not be actual pain generators. Degenerative joint disease may or may not cause pain. It’s not unusual for clients diagnosed with a degenerating spine to tie the pathology to the pain, but this kind of mental connection often causes much unneeded worry and stress. When working with these clients, it is best not to dramatize, catastrophize, or blame their pain on the pathology. The therapist must try to avoid words or graphic images that may trigger fear and possibly induce the nocebo effect. The opposite of the placebo effect, the nocebo effect occurs when negative beliefs and expectations influence a situation in a negative way. This is not to say therapists should avoid the study of orthopedic terminology. In my opinion, the more the therapist knows, the safer the client and the practitioner. Without an understanding of terminology, it’s difficult to visualize how neck cricks due to a degenerating spine can progress from protective muscle spasm to pain — and even more difficult to learn to derail the crick in its early stages. So, from one professional to another, let’s discuss a common example of how a simple neck crick might progress from spasm to degeneration to full-blown pain. The client begins noticing neck stiffness and loss of range of motion but no pain. As joint, ligament, and deep spinal groove muscles lose their ability to perform normal smooth gliding movements, specialized sensory receptors called mechanoreceptors are triggered. Their job is to alert the spinal cord of possible mechanical malfunction. The spinal cord reacts by recruiting head and neck righting reflexes that are often able to restore temporary gravitational balance by pulling the head and spine back into vertical alignment. 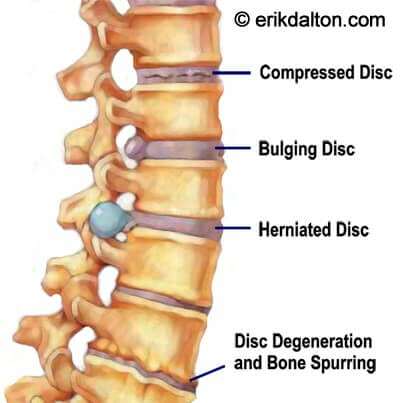 The client’s neck crick symptoms escalate as prolonged stiffness increases joint compression, resulting in disc compression, articular cartilage degradation, and possible nerve root impingement. Although inflammation is a natural and vital part of the injury repair process, prolonged exposure irritates surrounding soft tissues and hyperexcites chemical receptors called chemoreceptors. Together, the upregulated chemical and mechanical receptors bombard the spinal cord with warnings of excessive chemical and mechanical duress. In this progression, the combined mechanoreceptive and chemoreceptive stimuli becomes too much for the spinal cord reflexes to handle. Specialized danger-signaling receptors called nociceptors are recruited to fast-track information to the brain, warning of the possibility of tissue damage. The brain quickly interprets the nociceptive information — based on factors such as prior experiences, expectations, and mood — and passes that assessment along in several ways. The brain may choose to ignore the situation for the time being, lock the area up with protective muscle guarding, or trigger a pain response to persuade the person to do something about it. To help correct a forward- head carriage, the therapist’s extended fingers apply light C7– T1 sustained pressure as the client slowly extends their head. To help correct a left sidebending and right rotation musculofascial restriction, the therapist’s hands create a gentle counterforce. The client elevates their right shoulder against the therapist’s resistance to a count of five, then relaxes. Working with the nervous system, the therapist engages the new right rotation barrier. If the individual continues with his or her old patterns of overuse and abuse, the neck and shoulders may become sensitized to the pain. Prolonged exposure to the painful neck crick can trigger a host of unwanted symptoms, including sympathetic spasm in neighboring tissues. MAT therapists apply graded exposure stretches, nerve mobilization, and manual tractioning techniques in a controlled, comfortable manner to convince the brain that it is now safe to move stiff necks in directions that were once locked up. The therapist’s fingers and thumb secure each vertebral segment beginning at C3, while their right hand assesses for rotation restrictions in each individual vertebral segment. These MAT techniques are fantastic for clients suffering sensory motor amnesia, where habitual inefficient movement patterns have caused the brain to forget how to completely relax certain parts of the body, such as the neck and shoulders. By progressively introducing stretch to areas that have been problematic in the past, the nervous system begins associating the new movement with safety instead of pain. The subsequent reduction in pain, increased efficiency of movement and improved function are the desired outcomes of any bodywork strategy.